MAN Diesel & Turbo marked the sale of its 60,000th turbocharger after 80 years of turbocharger business, during the Marintec 2015 marine trade fair in Shanghai, by making a presentation to turbocharger customer, China Merchants Energy Shipping Co. Ltd. (CMES). The milestone has been reached with the (coming) delivery of 2 × TCA66-21 turbochargers, bound for an MAN Diesel & Turbo MAN B&W 7G80ME-C9 two-stroke engine powering a VLCC. The ceremony took place at the MAN stand at the trade fair where MAN Diesel & Turbo’s CEO, Dr Uwe Lauber, presented representatives from CMES with tokens of the company’s appreciation. CMES President Capt. Xie Chunlin, accepted a commemorative certificate and ornamental turbocharger turbine-blade on behalf of his company. Also present during the ceremony were representatives from Hoi Tung Marine Suppliers, MAN Turbocharger business partners in the Chinese market and representatives from CSSC-MES Diesel Co., Ltd.. 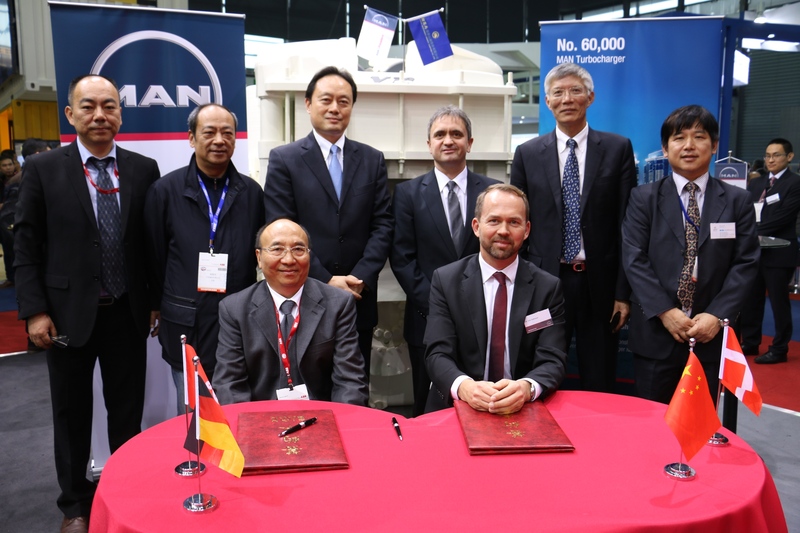 Earlier this year, Associated Maritime Co. (Hong Kong) Ltd. (AMCL), the management company of China Merchants Energy Shipping Co., Ltd. also took the opportunity to sign a premium maintenance contract with MAN Diesel & Turbo covering the service of 36 MAN turbochargers with effect from the start of 2016. The VLCC will be delivered in 2016 from Shanghai Waigaoqiao Shipbuilding Co., Ltd. and China Merchant Energy Shipping decided to source the engine and turbochargers from the same manufacturer. The CSSC-MES Diesel (CMD)-built MAN B&W 7G80ME-C9.2 main engine is part-load optimised with exhaust-gas bypass tuning and integrated with the two MAN TCA66 turbochargers. Turbocharger no. 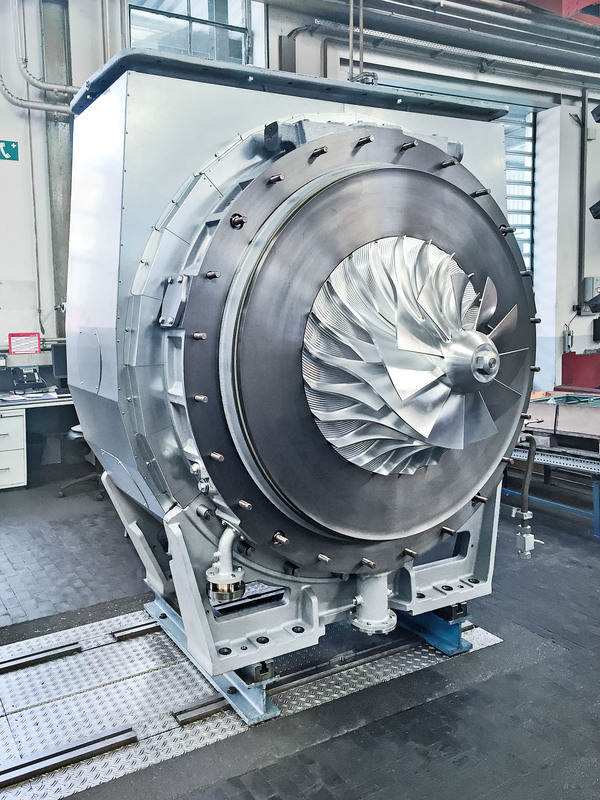 60,000, with serial number 7037348, was assembled at the MAN Turbocharger factory in Changzhou where most Chinese turbocharger components are localised. Core components, such as bearings and rotors, are produced at MAN Diesel & Turbo’s German facilities. The MAN TCA Turbocharger series was introduced to the market in 2003 and has more than 7,000 references. Globally, TCA turbochargers are mainly employed in two-stroke applications, but also have multiple four-stroke references. MAN Diesel & Turbo developed its first turbochargers in 1934. As an industry leader, MAN Turbocharger was first to set a standard for inboard, plain bearings for turbochargers with the TV624 type. In 2000, Czech turbocharger manufacturer PBS Turbo joined the MAN family and is today an affiliate within MAN Diesel & Turbo. PBS Turbo produces all TCR sizes from TCR10 up to TCR18, while larger sizes – TCR18 to TCA88 ¬– are produced by MAN Diesel & Turbo in Augsburg. Furthermore, other, current turbocharger series – MAN TCA and MAN TCR – are licensed to three major, global engine builders: Mitsui Engineering and Shipbuilding, Kawasaki Heavy Industries and STX Heavy Industries. Today, MAN is one of the leading suppliers of modern turbocharging solutions such as two-stage turbocharging or technologies tailor-made for Tier III applications. Its portfolio comprises turbochargers for marine engines, power generation, locomotive and mining applications. About China Merchants Energy Shipping Co., Ltd. Affiliated to the China Merchants Group, China Merchants Energy Shipping Co., Ltd. (CMES）was jointly established by the Sinopec Group, Sinochem Group, COSCO Group and CNOOC Group on 31 Dec 2004 based on the integrated ocean shipping assets under China Merchants Group. CMES runs a modern and diverse fleet of ocean-going tankers, bulk carriers and liquefied natural gas ships, covering most commodities of energy transportation. CMES operates and manages the earliest and most experienced oil-tanker and bulk-carrier fleet and is one of the largest energy-transportation enterprises in China. The fleet consists of 38 oil tankers of about 10 million DWT, 13 bulk carriers of 1.56 million DWT and 6 LNG ships of 0.9 million cubic meters (0.5 million DWT), with a total capacity of 11.28 million DWT at the end of Feburary,2015. An additional 20 vessels are on order with delivery due over 2015 to 2017. CMES is building up a well-structured, highly competitive and sustainable developing fleet. CMES, jointly with COSCO Group, established the first LNG fleet in China and six LNG carriers are now fully engaged in the importation of LNG into China. Owned by CMES, Associated Maritime Company (Hong Kong) Ltd. and Hong Kong Ming Wah Shipping Co. Ltd. respectively operate and manage the tanker fleet and bulk cargo carrier fleet. China LNG Shipping (International) Co. Ltd., jointly owned by China LNG Shipping (Holdings) Ltd and CNOOC (China National Offshore Oil Corporation), control the management of the LNG fleet.